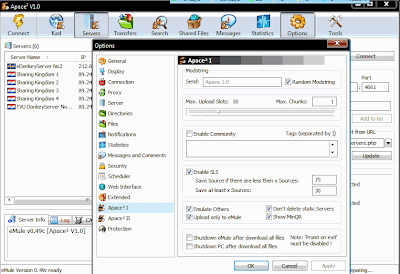 Apace Mod is one of the best eMule mods with the most features a mod can have. Now in latest emule Version 0.49c base available. Here too it is fast. I downloading with good full internetspeed 3mb/s, but i have these days a lot of line drops (internet down or fall out and reconnect). At me Apace² do a good job. jups by me Apace Mod is faster as official eMule. No problem with speed at all. Great mod! Keep it up! I run Apace 0.49c mod now and it works excellent. Good upload and download speed. Update to Beta 2 !!! Any modder that has a brain will understand. If he REALLY loves his code, why would he devote it to ruining the very network that allows his code to live? And no one will remember it. 2004/2005 ed2k had more than 120 leecher mods and it was at the highest point of most users. 2007/2008 80% of the leecher mods coders gone and it lost more and more users.